This article is about the area of Glasgow. For other uses, see Maryhill (disambiguation). It has been suggested that Maryhill Park be merged into this article. (Discuss) Proposed since February 2019. 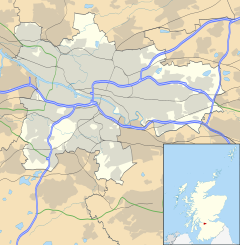 Maryhill (Scots: Maryhull, Scottish Gaelic: Cnoc Mhoire) is an area of the City of Glasgow in Scotland. Maryhill is a former burgh. Maryhill stretches over 7 miles (11 km) along Maryhill Road. Several sub-districts belong to the Maryhill district, such as Acre, Botany, Dawsholm Park, Firhill, Gairbraid, Gilshochill, Maryhill Park, North Kelvinside, Queen's Cross, St George's Cross, Cadder, Summerston, Woodside and Wyndford. The far north west of the area is served by Maryhill railway station. Map of the Maryhill area, circa 1923. Hew Hill, the Laird, or Lord, of Gairbraid, had no male heir and so he left his estate to his daughter, Mary Hill (1730-1809). She married Robert Graham of Dawsholm in 1763, but they had no income from trade or commerce and had to make what they could from the estate. They founded coalmines on the estate but they proved to be wet and unprofitable, and their property ventures are best known for an acre of ground they did not sell. It is still known as Acre today. No doubt they would have continued with the struggle, but on 8 March 1768 Parliament approved the cutting of the Forth and Clyde Canal through their estate, which provided some much-needed money. The canal reached the estate in 1775, but the canal company had run out of money and work stopped for eight years. The Government granted funds from forfeited Jacobite estates to start it again and the crossing of the River Kelvin became the focus for massive construction activity. Five locks, the great Kelvin Aqueduct and, between two of the locks, a dry dock boatyard were built. A village too began to grow up and the Grahams fed more land for its development; Robert Graham attached one condition that was to immortalise the heiress of Gairbraid, his beloved wife and the last in line of centuries of Hills of Gairbraid after the death of her father Hew Hill. The then village was to be "in all times called the town of MaryHill". The new canal waterway attracted industries including; boat-building, saw-milling and ironfounding to its banks within Mary's estate. By 1830 the scattered houses had grown to form a large village with a population of 3000 people. The building of the Glasgow, Dumbarton and Helensburgh Railway passing through Maryhill in the 1850s, and the proximity of the Loch Katrine pipeline, led to further growth and in 1856 Maryhill became a burgh in its own right. It was later absorbed into the boundaries of the city of Glasgow in 1891. A part of the Antonine Wall runs through Maryhill, in the Maryhill Park area, where there is the site of a Roman fort adjoining the wall in nearby Bearsden. A Roman bath-house may still be seen there. Maryhill had the first Temperance Society in the United Kingdom after lawlessness filled the streets in the Victorian era. Maryhill also boasts one of Glasgow's original Carnegie libraries, designed by the Inverness architect James Robert Rhind. Maryhill Barracks was opened in 1872 and once dominated the area that is now the Wyndford housing estate. It was home to the Scots Greys and the Highland Light Infantry, and held Adolf Hitler's second-in-command Rudolf Hess during World War II after his supposed "peace" flight to the UK. The barracks were decommissioned in the early 1960s. However the Territorial Army unit, the 52nd Lowland, 6th Battalion, the Royal Regiment of Scotland continues to be based at the adjacent Walcheren Barracks. 32 (Scottish) Signal Regiment is also based near Kelvinside, with 105 Regiment, Royal Artillery in nearby Partick. Maryhill was known as the Venice of the North for its canals and also for being the centre of the glass industry, with its Caledonia Works and Glasgow Works. The Glasgow Industrial School for Girls moved to Maryhill in 1882. Maryhill is part of the Glasgow Maryhill and Springburn constituency in the Scottish Parliament and of 21 Maryhill/Kelvin Ward on Glasgow City Council. Glasgow Maryhill was a constituency represented in the House of Commons of the Parliament of the United Kingdom from 1918 until 2005 when it was subsumed into the new Glasgow North constituency. Maryhill/Kelvin is a multi-member Ward and has four Councillors: John Letford (SNP), Mohammed Razaq (Labour), Martin Rhodes (Labour) and Franny Scally (SNP). The MSP for Maryhill and Springburn is Bob Doris and the MP for Glasgow North is Patrick Grady. The population of the Glasgow Maryhill and Springburn constituency is 73,493 as of 2015 and the population as of 2013 of the Maryhill/Kelvin Ward is 27,125. The largest section of the population by age is 45-64 (7,087) and the smallest is 12-15 (975). Although the population is predominantly White Scottish/British (22,784), Maryhill is ethnically diverse. The largest of these ethnic groups are Chinese and African (664 and 660 respectively). The charity Maryhill Integration Network was established in 2001 with the aim of bringing these communities together through, art, social, cultural and educational groups and projects. Although historically a working class area, as of 2013 there are more people employed in professional services than in manufacturing, construction and utilities in Maryhill. In 2011, the working-age population (16-64) was 18,770. Of these, 13,237 were economically active. According to the Glasgow Centre for Population Health, the level of income deprivation in Glasgow North West is 24%, while the figure for Maryhill is slightly higher at 25%. Many areas in the north of Glasgow are below the normal UK standard of living. However, not all areas of North Glasgow are in poor condition. Maryhill is in the north west of the city, and consists of well maintained traditionally "Glaswegian" sandstone tenements with the traditional high ceilings as well as many large Victorian town houses. There are also large housing association-run housing estates. The district contains the Wyndford and Gairbraid estate, a housing estate with a population of almost 5,000, containing a number of high-rise housing blocks, the highest four reaching heights of 26 storeys. These are intermixed with lower residences to create an estate of significant housing contrast and variety. Maryhill is the home of Firhill Stadium, which has been the home ground of Scottish Premiership club Partick Thistle since 1909. Originally from the burgh of Partick, the club moved to the Maryhill area in 1909, after struggling to find a new home nearer Partick. During 2005-2012, Firhill was also the home of professional Rugby Union team, Glasgow Warriors. The junior team, Maryhill F.C. and Glasgow's oldest athletic club (Maryhill Harriers) are also located in Maryhill. A branch of the Forth and Clyde Canal runs south from Gilshochill in Maryhill through Ruchill to Port Dundas: Ruchill Church stands beside the canal. Ruchill Church Hall was designed by Charles Rennie Mackintosh. The Forth and Clyde Canal flows through Maryhill, at one stage forming a vital part of the local economy. It was for many years polluted and largely unused after the decline of heavy industry, but recent efforts to regenerate and re-open the canal to navigation have seen it rejuvenated. Along the canalside, from the city centre along into Maryhill: plans for canalside flats, similar to the rejuvenation of old industrial warehouses in Manchester, have been granted. Twenty unique stained glass windows were produced by Stephen Adam in 1878 for the Maryhill Burgh Halls, depicting the many varied industries and occupations of Maryhill's inhabitants. The Burgh Halls, part of a complex of listed buildings including the former Baths & Wash-houses, the former Fire Station, and former Police Station, were restored in a £9.2M regeneration project, and a number of the original stained glass windows have been on display since late 2011. The Maryhill Lochs were the venue for the 2017 Red Bull Neptune Race on 18 March that year. Botany (55°53′27″N 4°17′34″W﻿ / ﻿55.8909°N 4.2929°W﻿ / 55.8909; -4.2929) is an area in Maryhill. One explanation for the name of the area that it was viewed as a rougher part of the then village of Maryhill, with many rough-and-tumble lodging houses and public houses, and many of its residents were expected to be deported to Botany Bay in Australia, then acting as a penal colony. However, a more prosaic explanation is that there was a school in the area known as the Botany School, now long closed, but the name survived. This reputation for being a rough area did not lessen over the years, with Botany (commonly referred to as 'The Butney' by local people) having many social problems of deprivation, unemployment and drug abuse. The local gang was known as "The Butny". The area has been completely cleared by the city council and is under construction for new modern apartment flats along with many other areas of Maryhill. The area's name is preserved by a local hosteliery which has called itself The Botany. A short-lived 1960s TV soap High Living created by (then) Cowcaddens-based Scottish Television was set in a tower block in the Wyndford area of Maryhill, however as a totally studio-based drama, it relied of pictures of the flats as part of the opening and closing title sequences. Taggart, an internationally famous Glaswegian detective television programme, which is translated into many languages including German and Japanese is set and filmed in Maryhill. Fans and tourists still come to the Maryhill Police Station to take photographs. Trainspotting, A cafe in Maryhill was used as a set in Trainspotting, Jaconelli's at the Queens Cross area. Also, Crosslands on Queen Margaret Drive was the pub where Begbie started a fight by throwing a glass over his head into a crowded bar. The hit BBC television comedy series Chewin' the Fat was filmed in the area, a precedent followed by its successor the sitcom Still Game. They often showed local features including the Forth and Clyde Canal in the background and several other areas and landmarks of Maryhill in outdoor shots. ^ info@undiscoveredscotland.co.uk, Undiscovered Scotland:. "Bearsden Roman Baths Feature Page on Undiscovered Scotland". www.undiscoveredscotland.co.uk. ^ a b c "Maryhill/Kelvin Ward factsheet". Glasgow City Council. Retrieved 27 January 2017. ^ "Bob Doris". www.parliament.scot. 2016-06-05. Retrieved 2017-01-27. ^ "Patrick Grady MP". UK Parliament. Retrieved 2017-01-27. ^ "Scottish Parliamentary Constituency Population Estimates". Retrieved 27 January 2017. ^ "About Us". Maryhill Integration Network. 2012-02-17. Retrieved 2017-01-27. ^ "GCPH - Glasgow City Profile" (PDF). Glasgow Centre for Population Health. Retrieved 27 January 2017. ^ "Maryhill Burgh Halls". Maryhill Burgh Halls. ^ Richardson, Liz (23 March 2017). "Red Bull Neptune Steps". Going the (middle) distance. Retrieved 7 December 2018. ^ "Cafe D'Jaconelli, 570 Maryhill Road, Glasgow". eggbaconchipsandbeans. ^ Reeves, Tony. "Filming Locations for Danny Boyle's Trainspotting (1996), in Scotland and London".